It’s so important to sit and listen to children. Recently, I sat with fifth-grader Reggie who had broken his foot. “Isn’t the cast coming off next Monday?” I asked. “Yes, and I can hardly wait!” he said. “I’ve been praying for you,” I told him. “I bet you pray for me every night before you go to bed,” he said. My heart was so moved for this precious child. We talked more and I tried to assure him that he can trust God to do the right and just thing every time, especially with his Dad. Not more than an hour later, a second-grader asked if she could share a prayer request with her Kids Club friends. She spoke candidly about her pain in having her mom move away. When she asked for prayer, the children did pray. And then a dozen more hands went up — more kids with prayer requests. It’s not always like that in Club, to be honest. Sometimes the kids are rude or skeptical during prayer. But this day seemed a special day for prayer. Earlier that day I had spent an extended time in prayer with a volunteer who comes weekly to pray. We had seen our prayers answered that morning when one of the community women came for Bible Study and signed up to join us for at a Christian women’s event. How thankful I was for that day of prayer! It made me think of an earlier time when I was visiting a neigh- borhood home. While I talked with the Mom a sweet preschool- er sat on the stairs, half-listening and half-babbling in baby talk. right as I was ready to leave the little girl said “Ah-MEN!” Her mom laughed. “She knows when you come, you pray,” she said. Well, that day a little child beat me to it. I am constantly rejoicing in the victories we see God bring here on a daily basis, as I try not to get overwhelmed with the brokenness of the world. Working in our neighborhood, it is so evident to me that only God provides, sustains, and restores. Our hope is that everyone in our community would grasp this life changing truth. Systems fail, governments fail, people fail, and I fail but God He does not, and will not. Having said that, I want to share about a day I had recently, and invite you to rejoice along with me in the small victories the day held. This day, like any other day, is never about me, but the work He is doing in my life and the lives of our students. 2:30 PM: Prep Time. I setup for another day of program, grabbing the last of the materials needed, snack items, and doing any last minute preparations. 3:00 PM: Everyone Arrives. Students and StreetLeaders arrive, and students begin doing their homework. Those who don’t have homework can participate in a quiet activity like reading or drawing. StreetLeaders seem to really enjoy this time helping students with their homework, as they really con- nect with a couple kids at a time. StreetLeaders take the lead on this part of the day, giving them the opportunity to help and discipline as they see fit. 3:45 PM: Bible Study. Tuesdays we have been diving into the New Testament using a curriculum called The Story. The students seem to really connect with the creative videos. 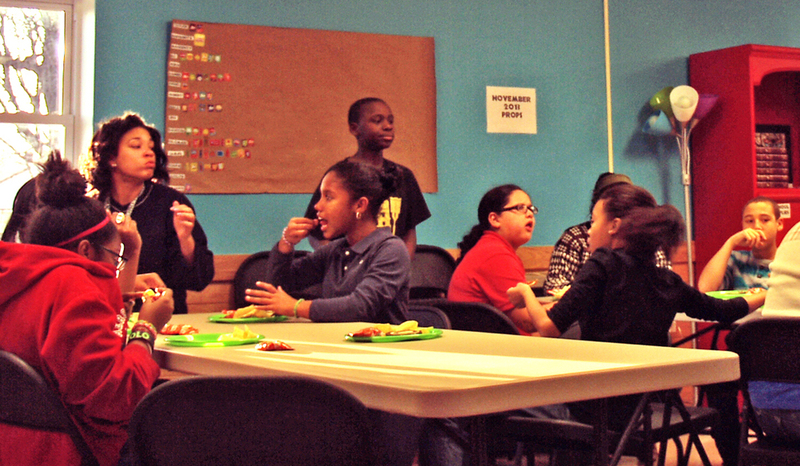 After the videos, StreetLeaders usually lead small groups of 4-5 students. Questions bring the story to life for them, as StreetLeaders provide a real example of what it means to be a servant leader in the neighborhood, living out what we are learning. As we are learning about Jesus, some of the ques- tions that are asked are tough. Though some underestimate middle school students, they definitely have deep questions, sometimes rooted in their biggest doubts and fears. 4:20 PM: Snack Time. For some students, I know this is their favorite part of program. For others, it is the most nutritional meal of their day. We have an extensive baked potato bar as well as yogurt, carrots, and some other goodies. I have to run to the other building to grab the ranch dressing, as I have only met a couple students who can eat carrots without it. Snack time is definitely a time where StreetLeaders are free to interact with students in one of their most natural states. The youth get very talkative, and if you listen carefully, you can hear all about the drama of their day, their new favorite song, or even who’s been grounded. Before snack we say a prayer. It is great to see students excited to pray for the meal, and thank- ing God for their friends, family, and the people that support NETwork in various ways. 4:45 PM: Free Time. Students can play inside or outside. Basketball, gaga ball, and foosball all run at high intensity for the next 15 minutes, until FLAVA is over for the day. I lose one game of foosball today, but was able to add a tally to my name for all-time wins. 5:00 PM: Program Ends. I see all the students off and finish up some office work. StreetLeaders spend the next half hour cleaning. A couple begin washing dishes, and the others wipe down tables and vacuum. I have plans at 6 PM with a student. So as soon as the StreetLeaders are finished we will have our meeting. 5:30 PM: StreetLeader Meeting. This is a great time to get a gauge from our high school students on how the day went. We give props (incentive points) to students who had good behavior for the day, and we discuss plans for the rest of the week. There is some time for StreetLeaders to ask questions about the Bible lesson, and then we end with a time of prayer. 6:00 PM: Dinner with a Student. 6:00 comes and goes; Shavonne never shows up. In our neighborhood, consistency and commitment are big struggles. Partially because these students aren’t learning these important concepts in other areas of their life, and partially because they are kids and they usually decide to do what seems to be the better option at the time. Around 6:30 I leave to pick up dinner for myself and and perhaps a roommate or two, realizing that Shavonne is prob- ably not coming. The meeting wih Shavonne was planned because I had seen some drastic life-threatening posts on her Facebook page and wanted to address the seriousness of the things she posts online. really, dinner is a good way to have a meeting, communicating that she has our support at NETwork, and that God loves her a lot. 6:40 PM: A Phone Call. One of the FLAVA students’ parents calls. She asks if I am at NETwork, and I told her I could be there shortly. After picking up my pizza, I offer to come to her house. I arrive at her house and after talking with Madison’s mother for awhile, Madison asks to speak with me alone. When her mother leaves the room, she immediately asks for prayer. We spend some time praying together for her and her family, and she mentions that they didn’t have dinner prepared. I have dinner in the car and bring it in for their family to eat. 7:20 PM: Shavonne Contacts Me. Shavonne is free for dinner. She had been spending time with her grandmother. We grab food from Panera and take it back to my house for dinner. She needs some help with her homework, so we start with that and chat about her life. We talk some about what a good friend is, the importance of managing stress, and how important she is to a lot of people. My neighbors and room- mates come over to see Shavonne. They all hang out with her on a pretty regular basis, so they were happy to see her. 9:30 PM: Shavonne Goes Home. I drop Shavonne off at home. As she gets out of the car she says that it was cool how people came over to see her. She also says she enjoyed hanging out. Days like this don’t happen all the time, but it was one of my favorite days to date working here at NETwork. Witnessing leadership development in the StreetLeaders, a student asking for prayer, planned dinner with a student happening. These small victories are all ways in which God is planting seeds. When kids feel cared for, when students know they can trust you, when children can have godly role models, it creates a true atmosphere of ministry. The Holy Spirit is at work. It’s no surprise that kids love camp! This year we offered more options than ever before, including a Swim Camp at Rhodes Grove, a Day Camp led by Chambersburg BIC Church’s youth group, and several weeklong overnight camps at CRC, Cove Valley, and Camp Joy El. But this year we also made a special effort to go to camp with kids! Three NETwork families and Denise and Gary Williamson participated in Cove Valley’s Family Camp together. Moms dared the high ropes course and the holey canoe race. Kids who had been to camp before made sure they introduced NETwork’s new kids to all their old camp buddies and fun camp activities. NETwork families shared childcare, transportation, and a great time together! At the end of July, nine FLAVA teens went with Tasha and Ben to Ligonier Camp, near Pittsburgh. It was a week of growing closer to God and each other. Students were chal- lenged to face their fears as they climbed into the trees, participating in the high ropes courses. Our NETwork students also won the competition for scripture memorization, memorizing a passage from Hebrews. Total, over 50 kids participated in camping ministries through NETwork this summer. We want to especially thank those who helped to sponsor these youth!